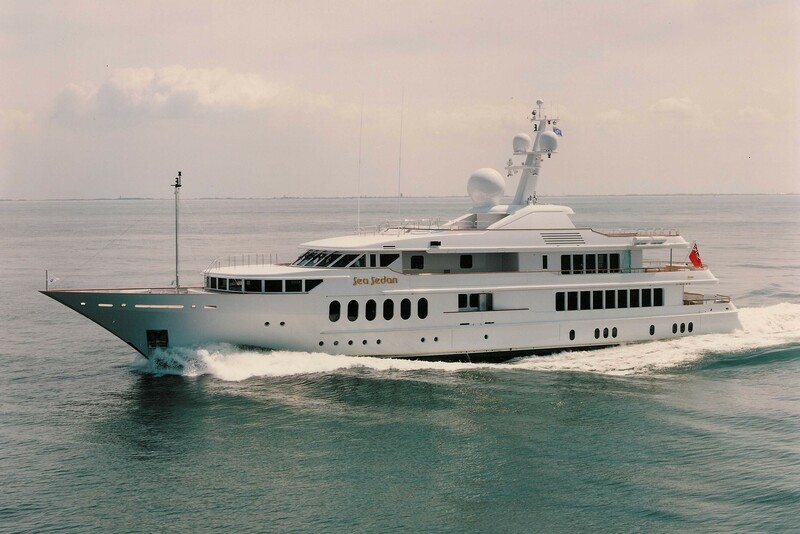 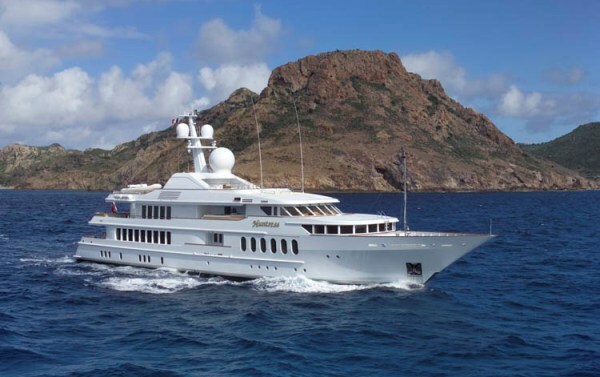 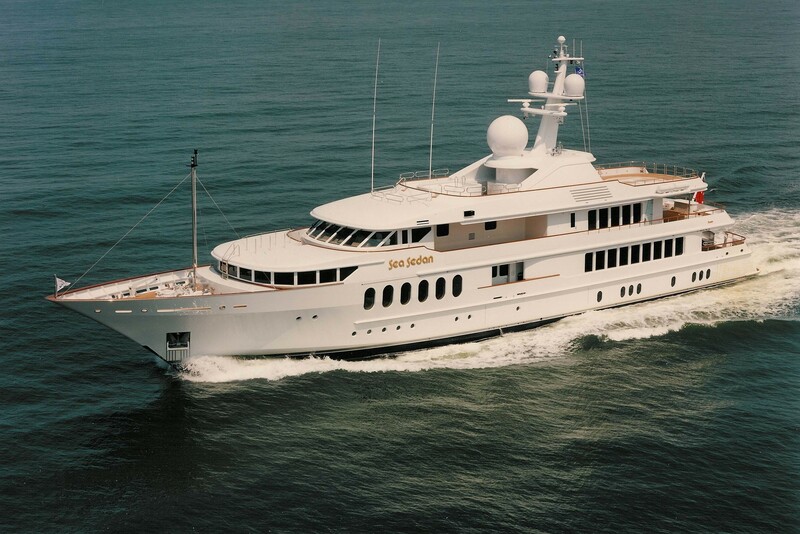 Motor yacht Huntress, which is 54,86m (or 180 ft) in length, is a steel displacement superyacht as built and launched in 1997 by the highly acclaimed Dutch Feadship shipbuilding company. 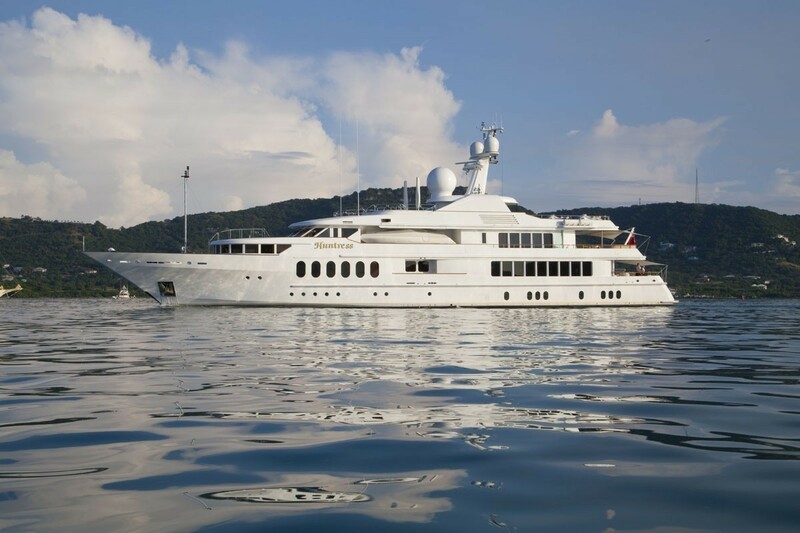 She is a magnificent and large luxury yacht which provides safe and sumptuous accommodation for up to 12 guests, in 5 cabins. 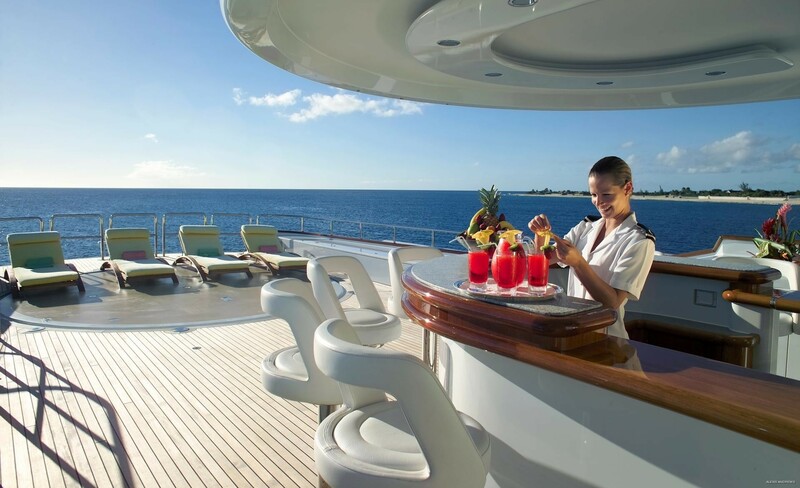 HUNTRESS was designed and built for the purpose of safe and luxurious worldwide cruising. 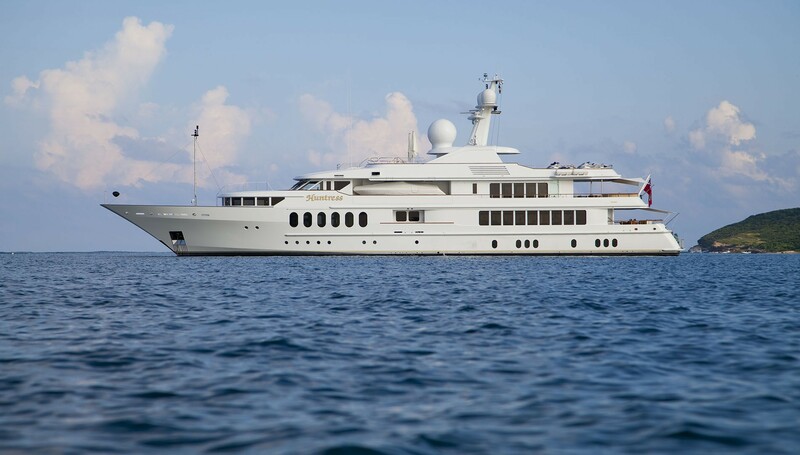 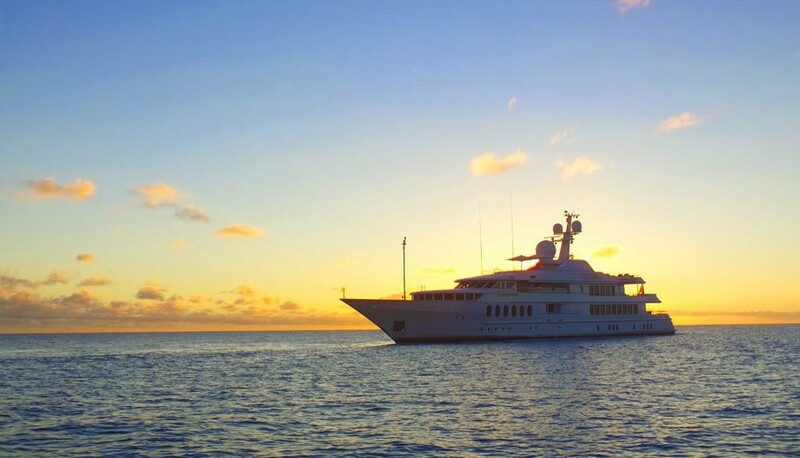 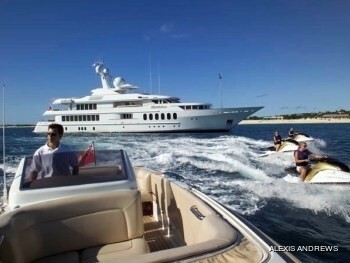 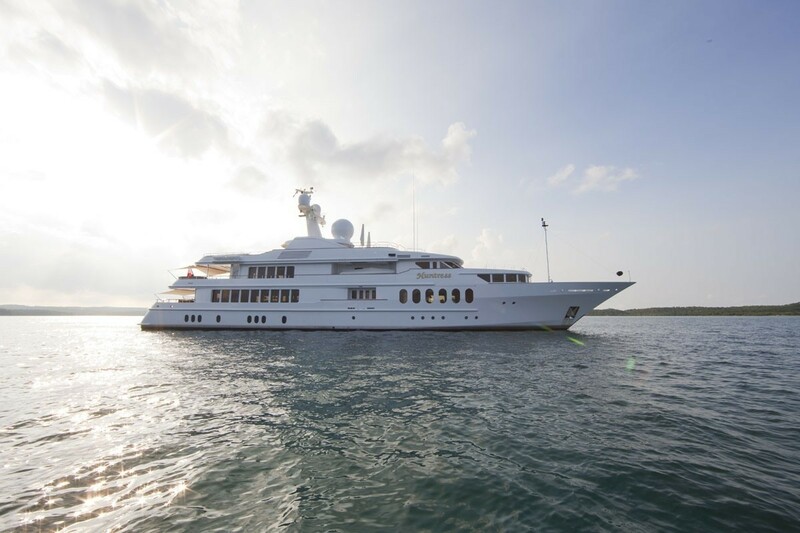 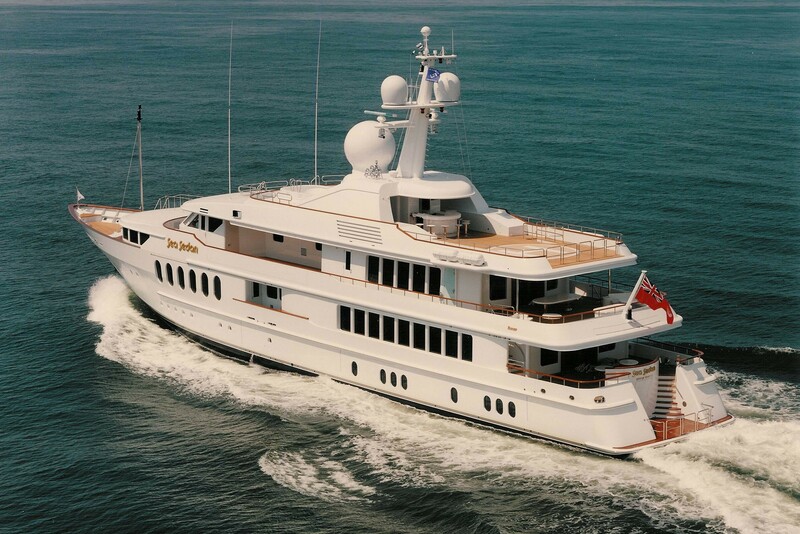 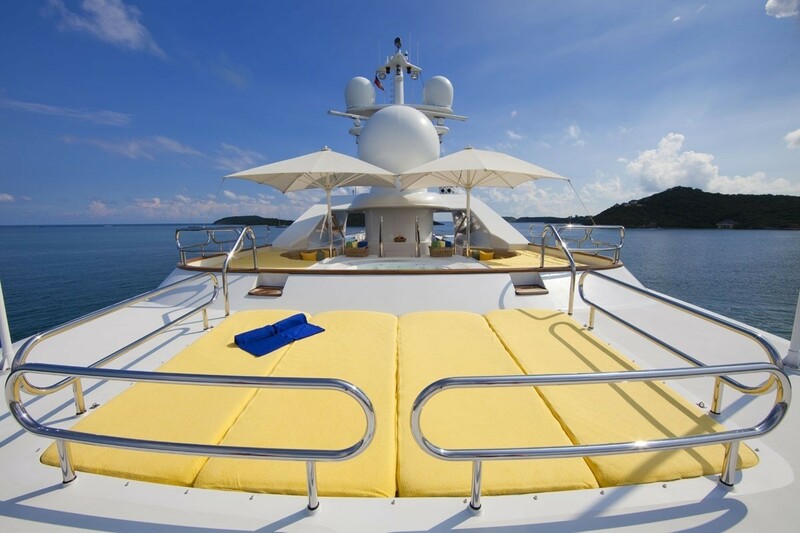 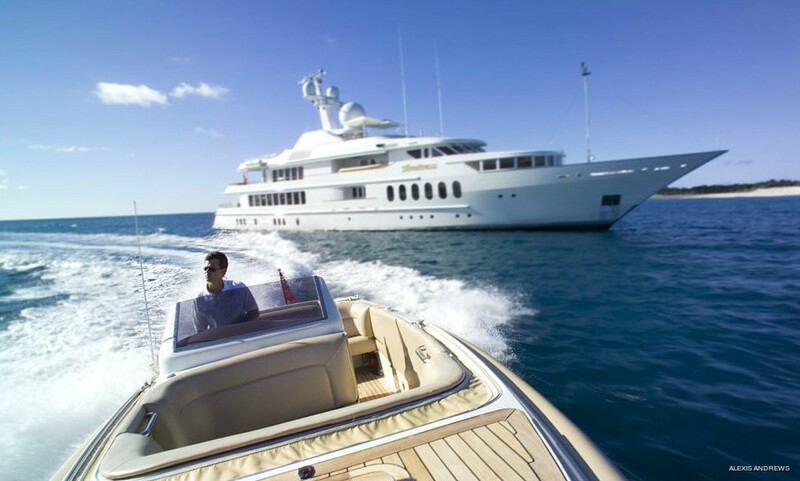 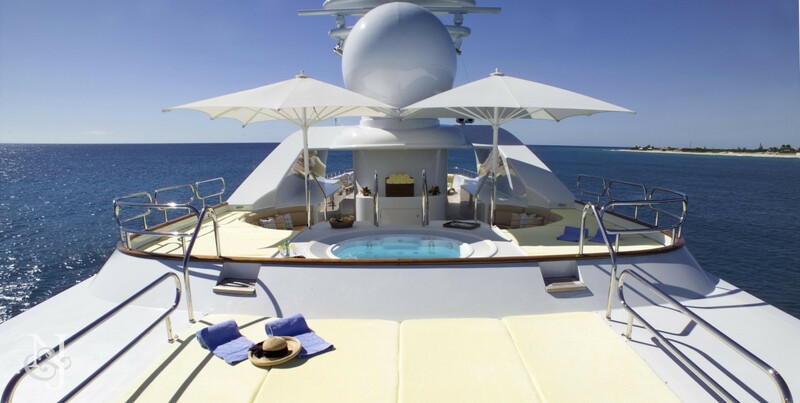 A solid superyacht, she has spacious social and living areas as well as specialised technology for longer voyages. 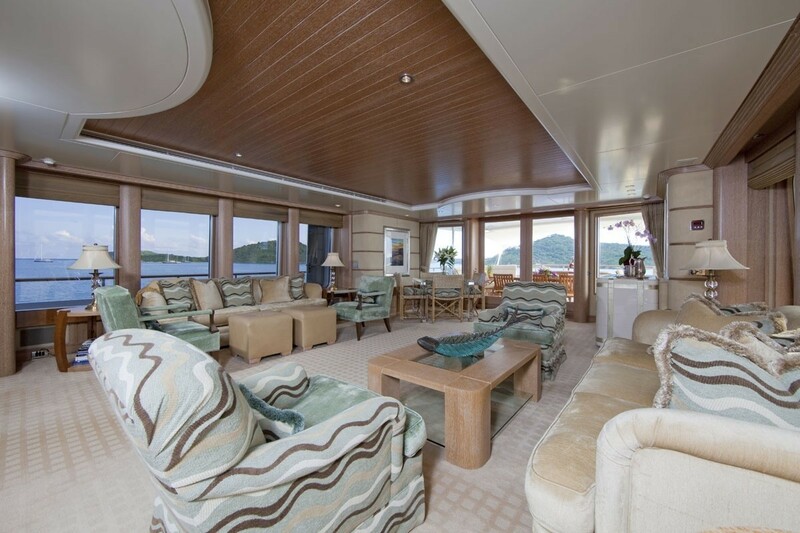 Terence Disdale designed her interiors that are simple and uncluttered and from inside you can gaze on panoramic views through several large windows. 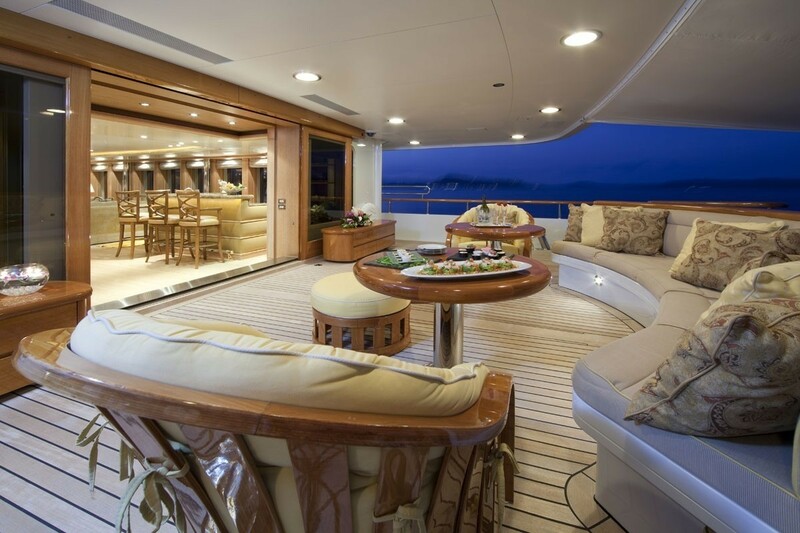 Her salon is inviting and full beam, with a bar and thoughtfully placed seating that allow guests to fully enjoy the views through the large windows. 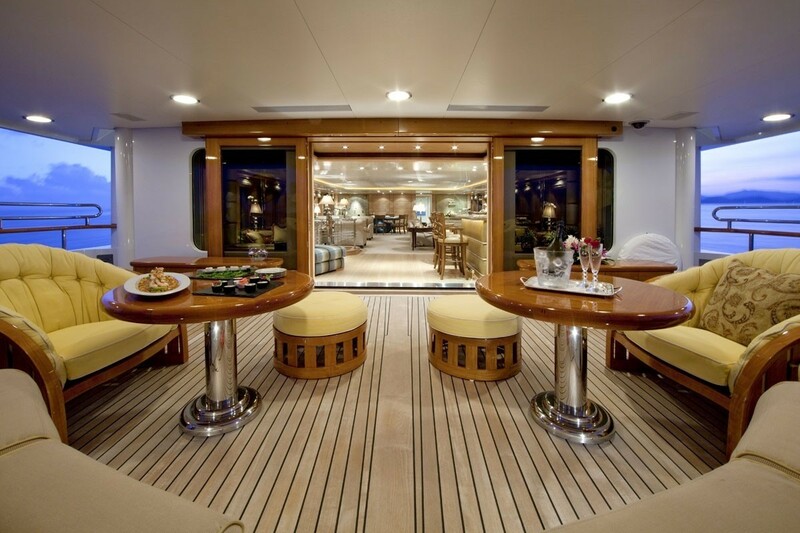 The dining area is adjoining. 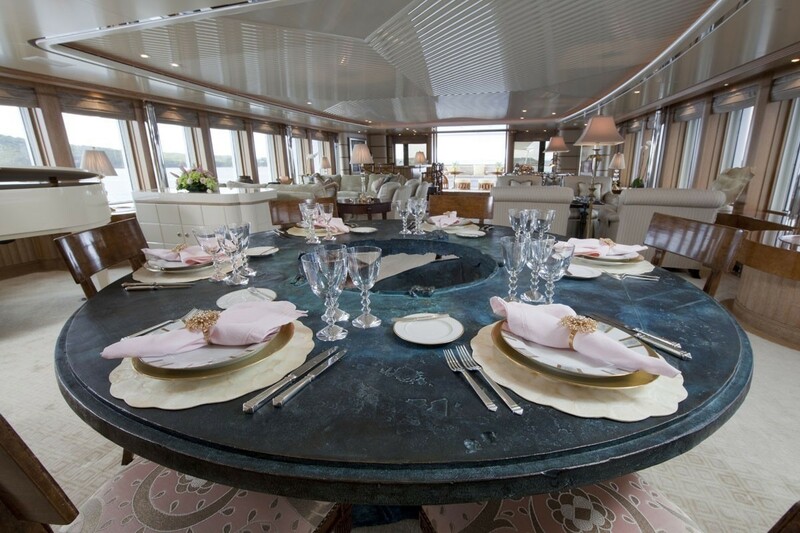 It boasts an exquisite bronze Mitoraj dining table, which in itself is quite the piece of art. 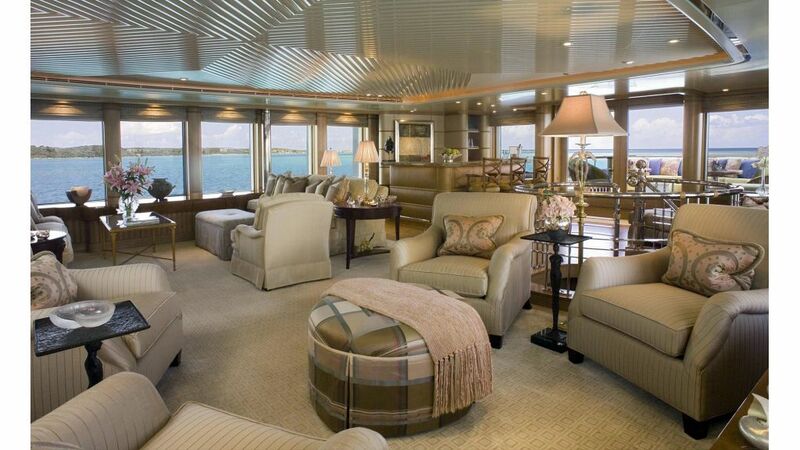 A self playing Grand Piano is also located here and adds even more charm to this already welcoming deck. 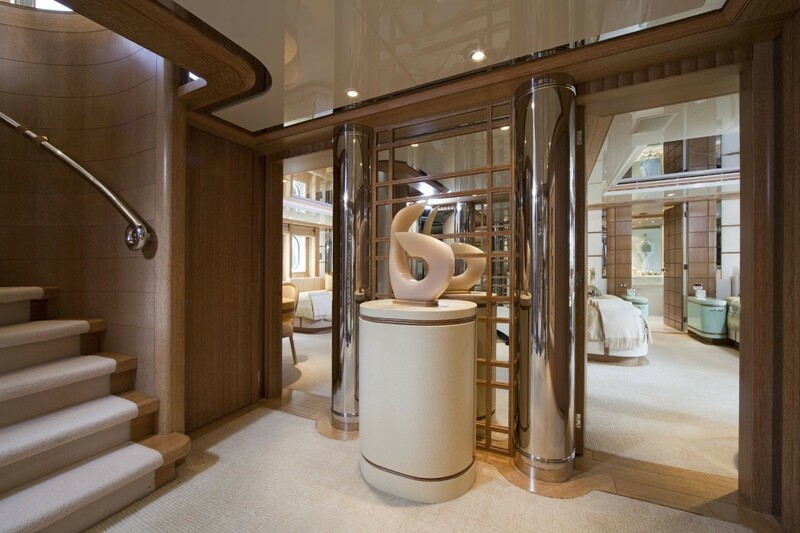 A curved staircase leads from the salon into a large square guest foyer where a coffee station is found tucked away behind a door. 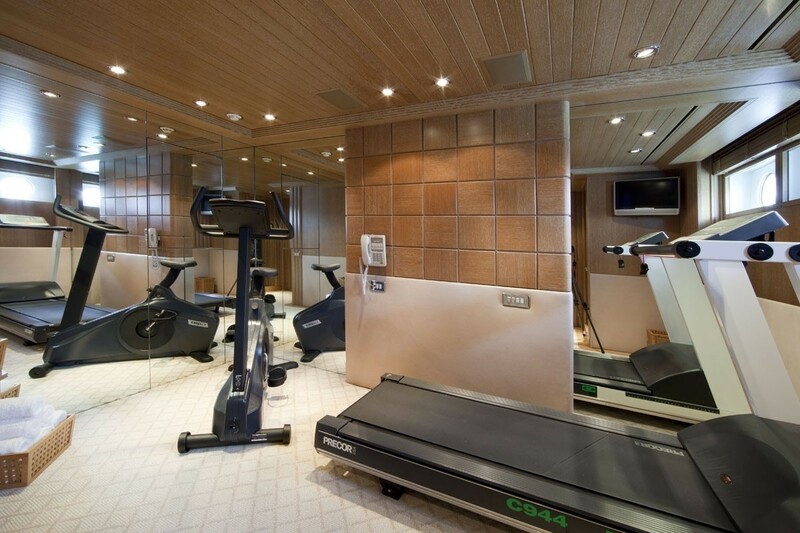 This area leads into the guest cabins as well as the Gym. 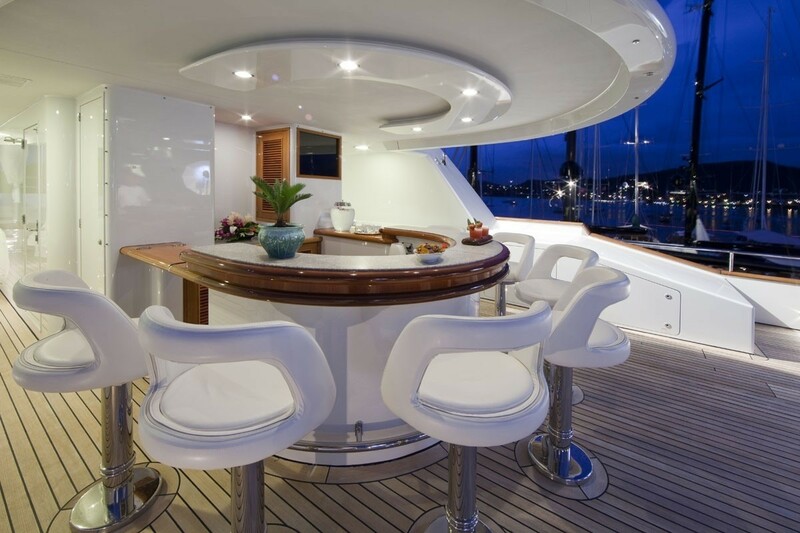 The Skylounge is a great place to relax, with a card table and comfortable seating. 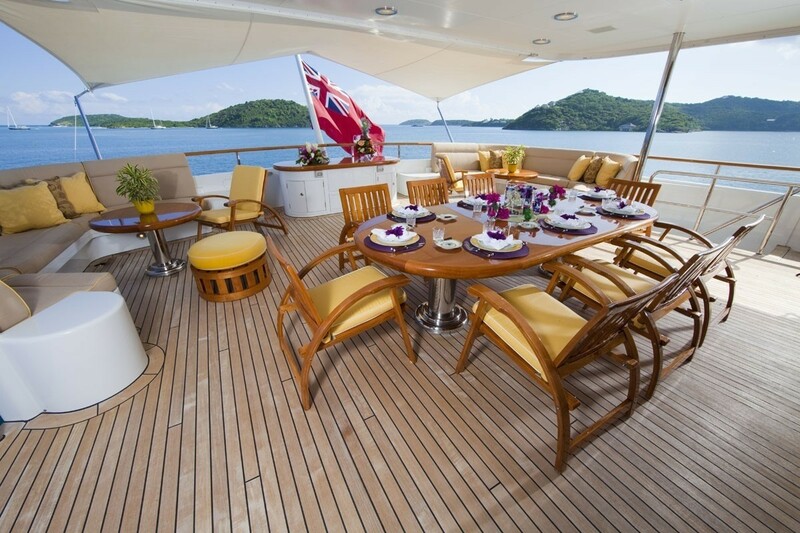 Casual lunches can be had on the bridge deck, where guests will find a BBQ. 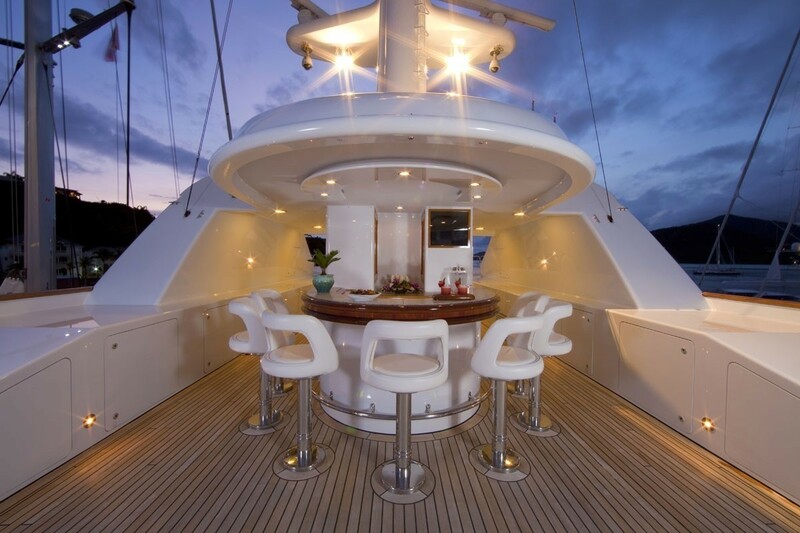 The sun deck offers a bar with stools, perfect for the evening drink or aperitif under the sun. 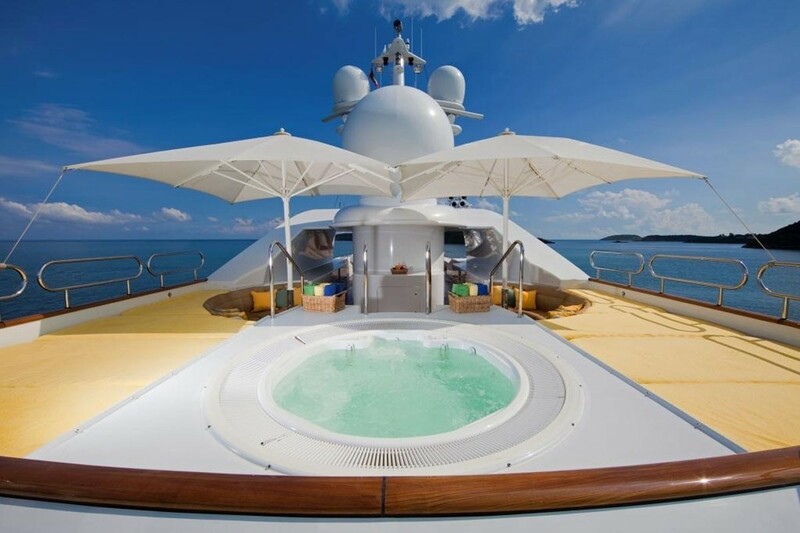 A Finnish Sauna as well as raised Jacuzzi with ample sun pads are found on either side. 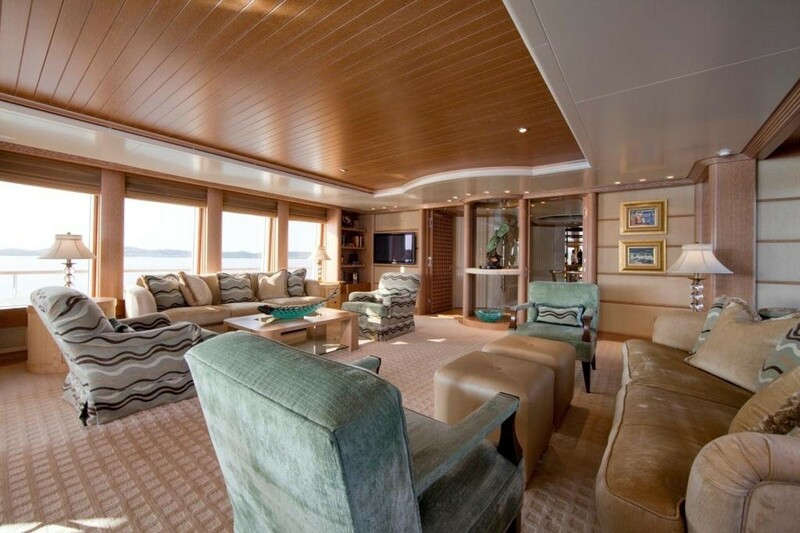 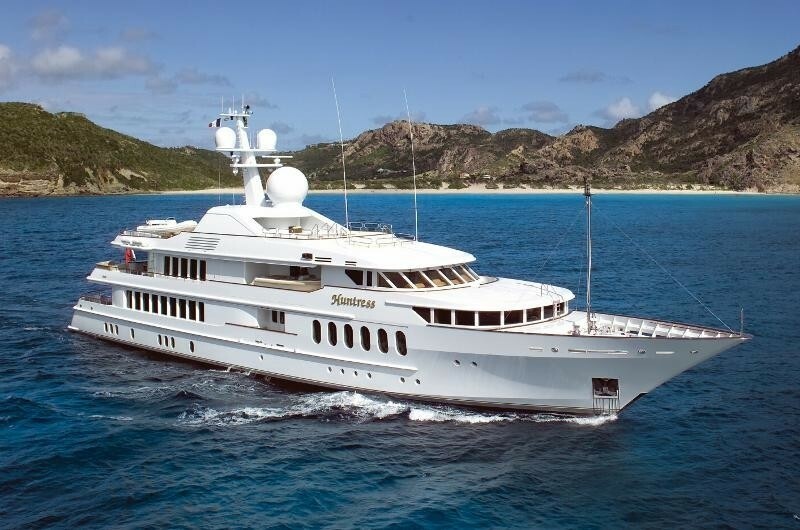 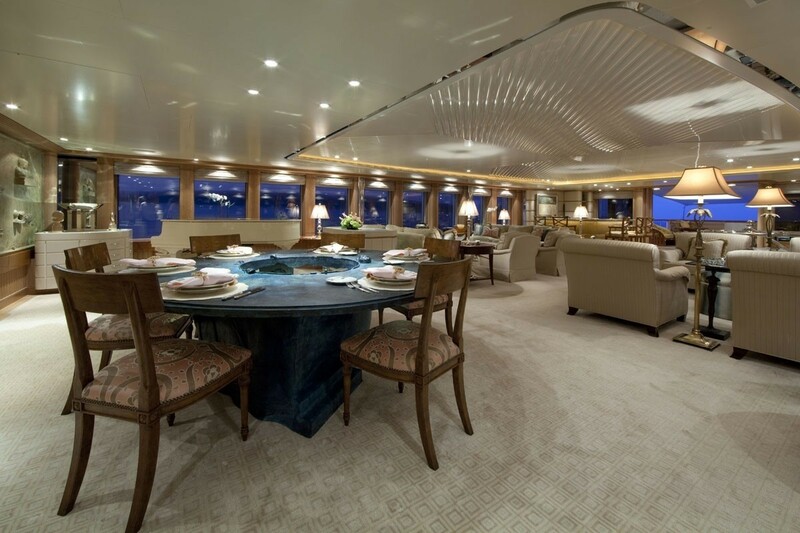 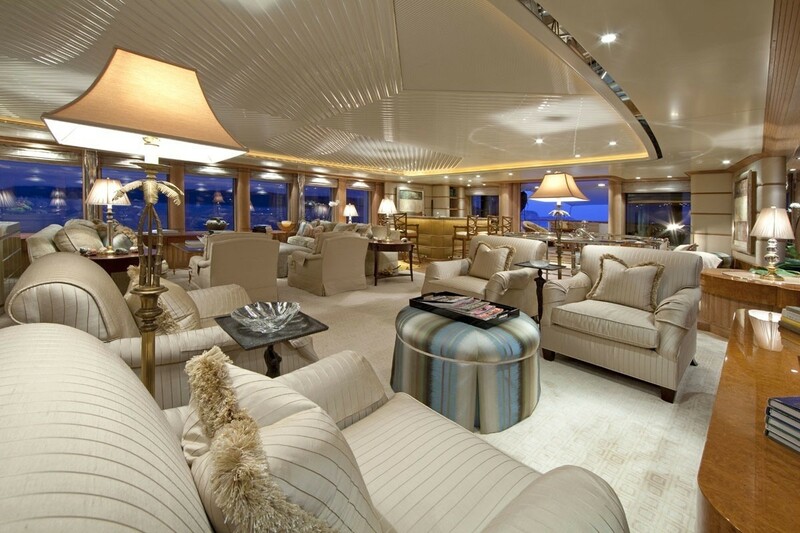 Well maintained, HUNTRESS II saw an interior refurbishment in 2005, including new soft goods, furniture, carpet and the addition of a bar in her main salon, as well as state of the art home theater system and electronics. 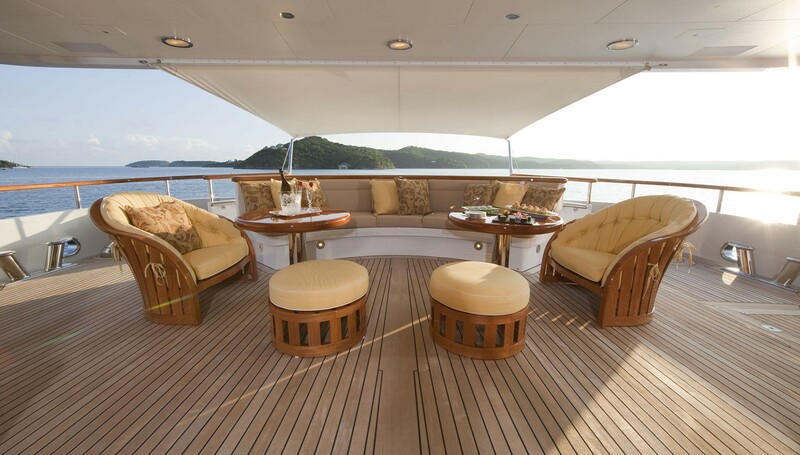 2013 refurbishment saw new teak decks. 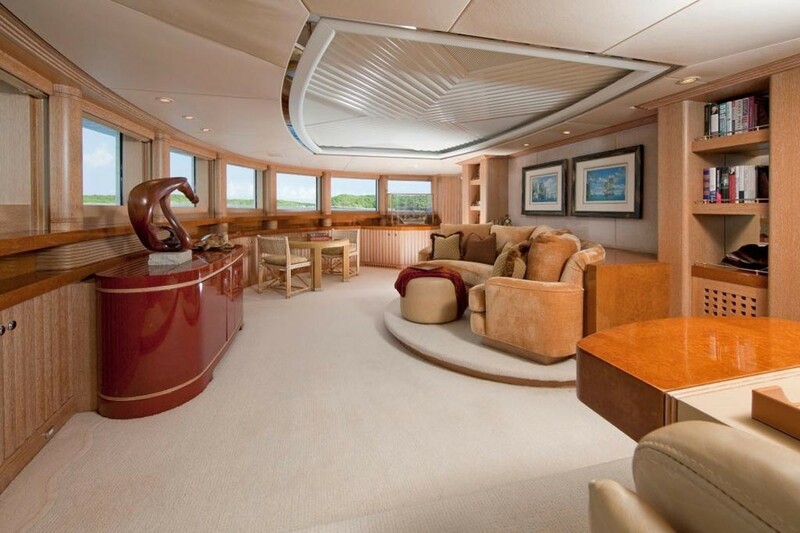 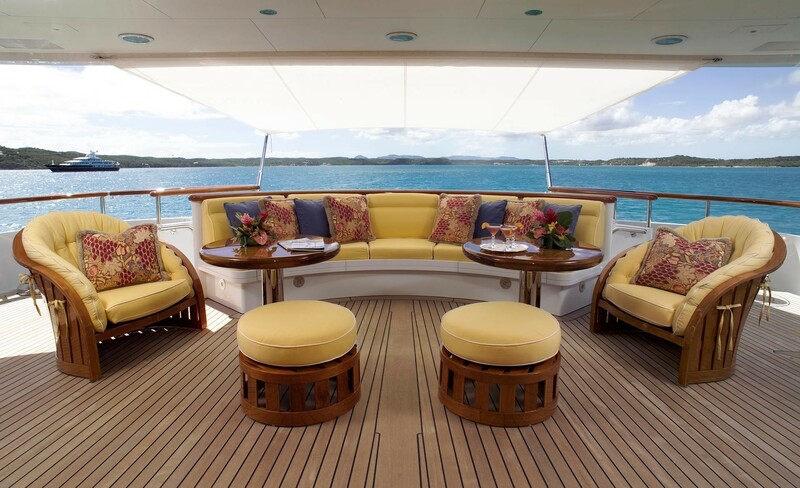 HUNTRESS II has open outdoor focused living spaces, generous accommodations and excellent entertainment options. 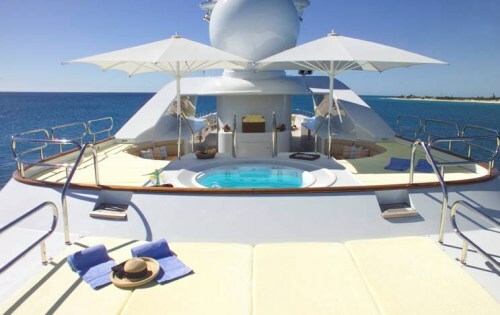 Her deck Spa Pool and water toy list complete an impressive package of features. 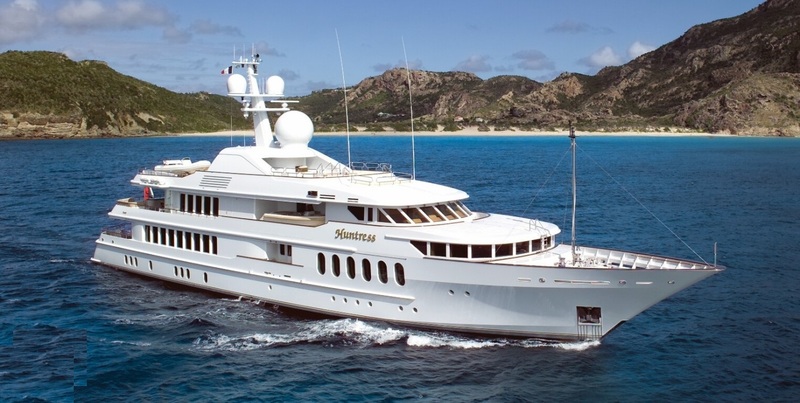 Luxury yacht Huntress has two powerful yet efficient caterpillar 3516 DI-TA diesel engines. 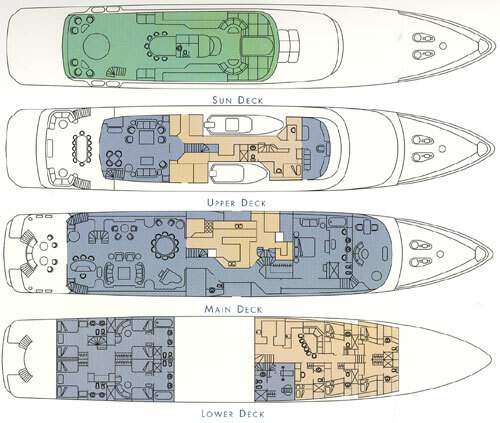 Her maximum speed approaches 15 knots and she can cruise comfortably at 12 knots. 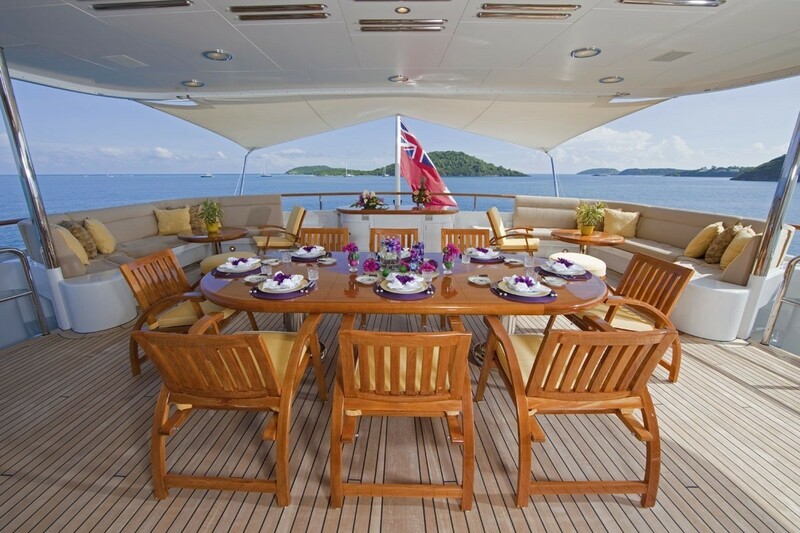 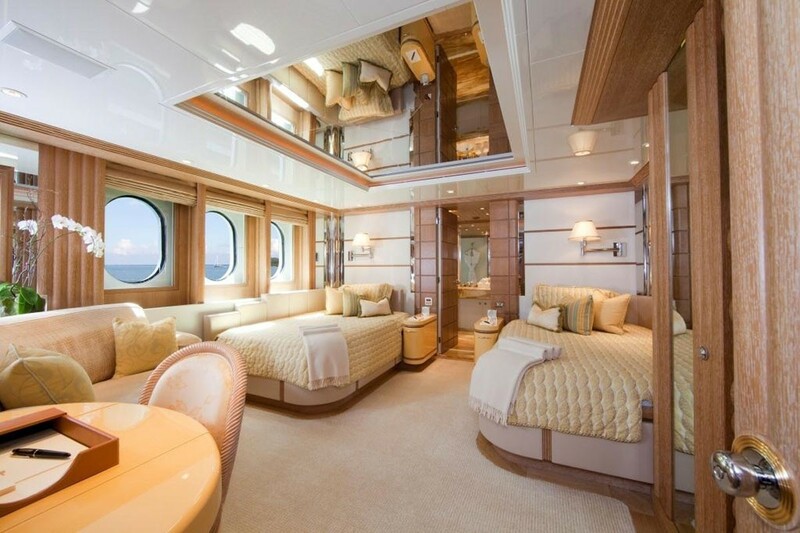 HUNTRESS can accommodate up to 12 guests in 5 cabins. 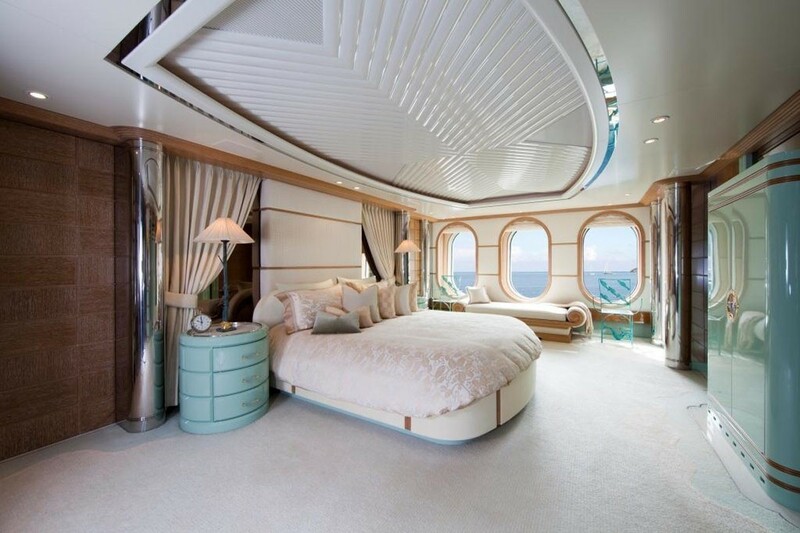 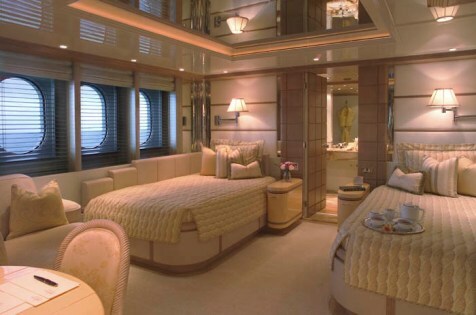 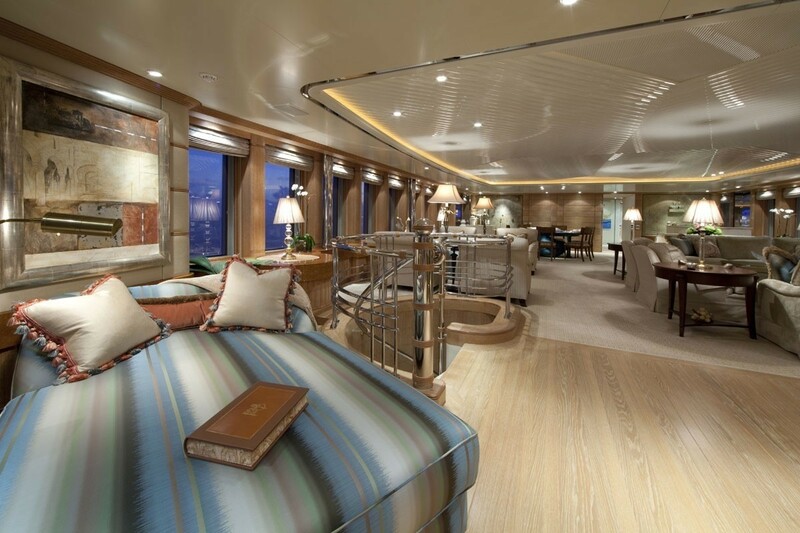 Her large Owner's Suite has a king bed and a private study/observation lounge as well as his and hers dressing. 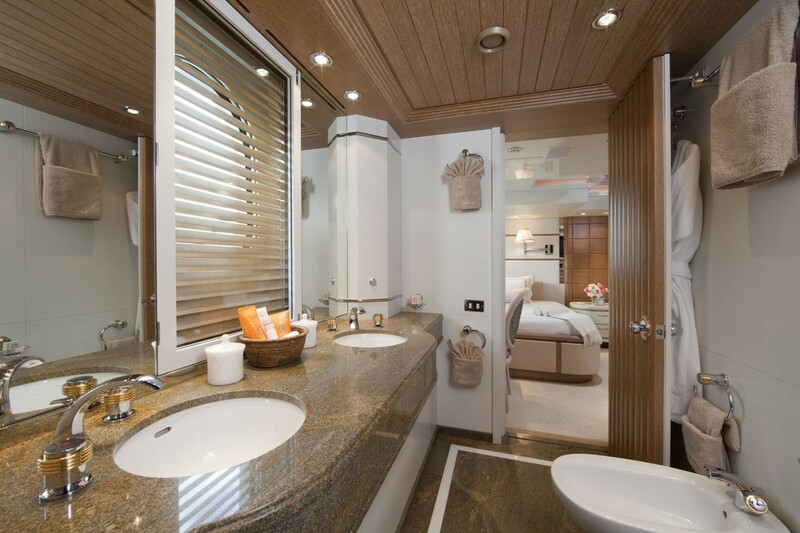 Its ensuite boasts a jetted bath tub and steam shower, separate toilet and bidet. 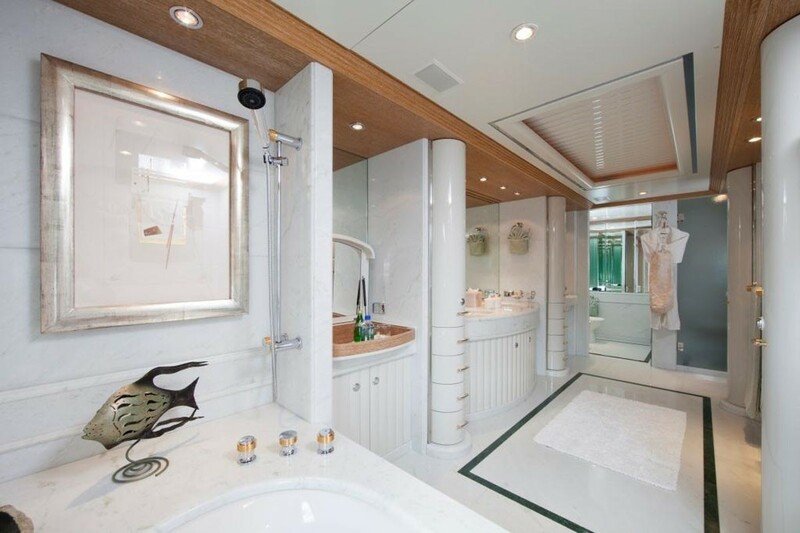 With four generous guest suites, each luxurious guest stateroom has two full size double beds in each and features an ensuite bath finished in different exotic marbles that co-ordinate with the predominant color scheme. 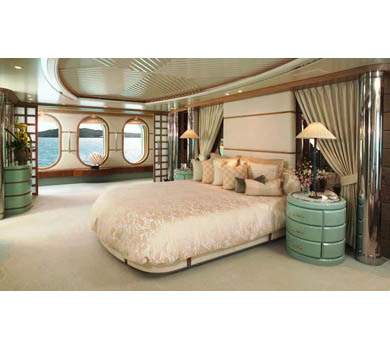 Large oval ports in all suites supply outstanding marine views. 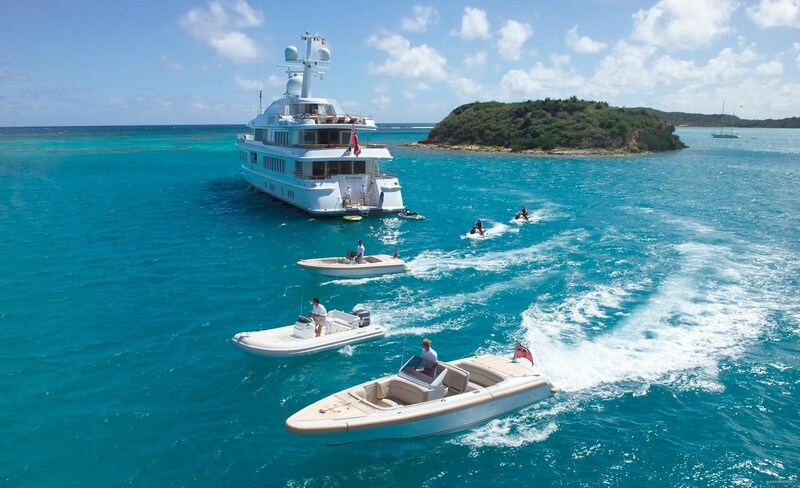 Tenders & Toys 29' Custom Tender w/twin turbo diesels 22' Novurania w/225 hp outboard. 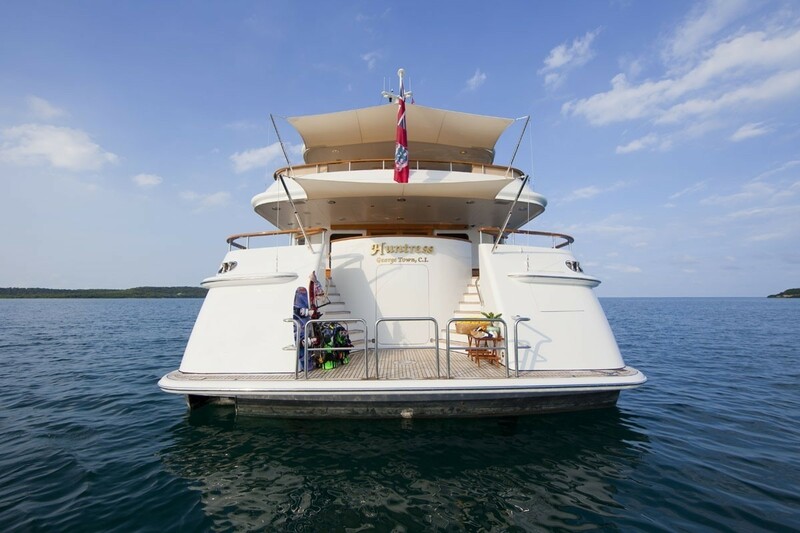 14' Novurania w/25 hp outboard 3x Yamaha WaveRunners 1x Yamaha 750 Jet Ski Towable Banana Various Water Tow Toys Extensive fishing gear Waterskis Complete Scuba gear for certified divers Snorkel gear Exercise room with treadmill, stair climber, free weights, full bath. 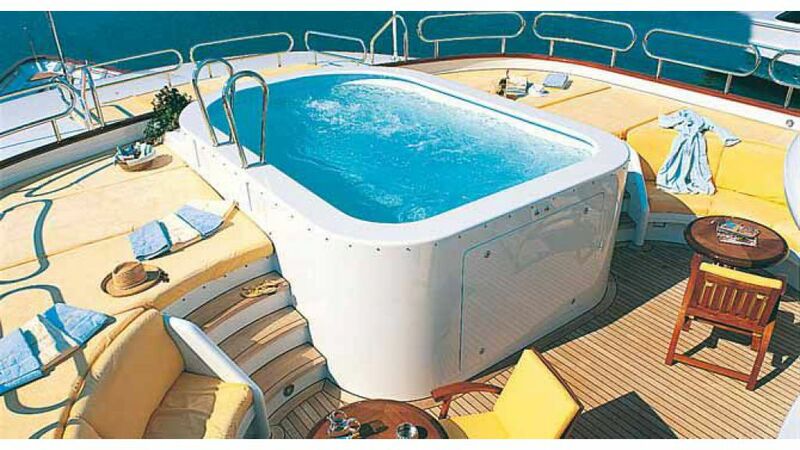 Finnish dry heat Sauna Spa Pool on Sun Deck Communications VSAT High Speed Internet and Email, Satcom, Fax, European and North American GSM telephones Audio Visual Equipment and Deck Facilities Satellite TV,DVD/VCR, CD, Plasma TVs Baby grand piano January 2013 New TOYS added: *4 Seabobs F7 for winter season (2 available for Med charters), Laser Pico Sailboat, 2 Paddle boards.